The feasibility of utilizing cellulosic biomass such as corn stover as an energy feedstock is dominated by factors such as facility location, feedstock availability, and transportation cost. Previous research showed the advantages of using a GIS-based method compared to a previously used concentric ring buffer method. Even though the GIS-based method proved to be more accurate because it precisely calculates the distance from the facility to the farms using a real road network and the hectares of crop-specific fields in a given service area, opportunities exist to further improve its accuracy. 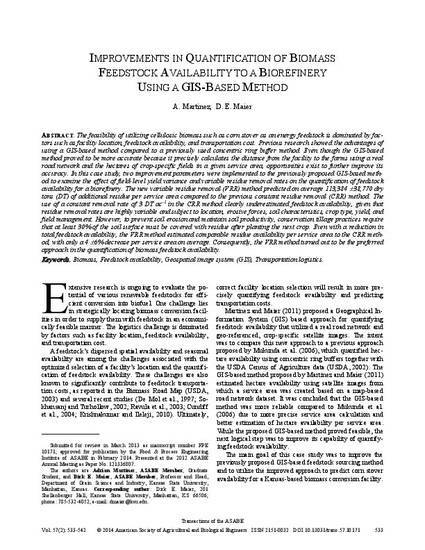 In this case study, two improvement parameters were implemented to the previously proposed GIS-based method to examine the effect of field-level yield variance and variable residue removal rates on the quantification of feedstock availability for a biorefinery. The new variable residue removal (VRR) method predicted on average 113,384 ±38,770 dry tons (DT) of additional residue per service area compared to the previous constant residue removal (CRR) method. The use of a constant removal rate of 3 DT ac-1 in the CRR method clearly underestimated feedstock availability, given that residue removal rates are highly variable and subject to location, erosive forces, soil characteristics, crop type, yield, and field management. However, to prevent soil erosion and maintain soil productivity, conservation tillage practices require that at least 30% of the soil surface must be covered with residue after planting the next crop. Even with a reduction in total feedstock availability, the VRR method estimated comparable residue availability per service area to the CRR method, with only a 4 ±6% decrease per service area on average. Consequently, the VRR method turned out to be the preferred approach in the quantification of biomass feedstock availability. Copyright 2014 American Society of Agricultural and Biological Engineers. Used with permission.